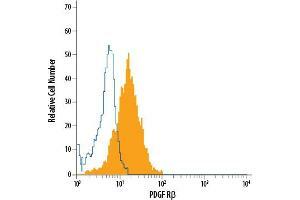 Detection of PDGF R beta in MG-63 Human Cell Line by Flow Cytometry. MG-63 human osteosarcoma cell line was stained with Mouse Anti-Human PDGF R beta Fluorescein-conjugated Monoclonal Antibody. Specificité Detects human PDGF R beta in Western blots. Specificity has been confirmed in binding studies using several different cell lines (1, 2) and by its ability to immunoprecipitate PDGF receptor beta-subunit complexed with 125I-PDGF-BB (3). It does not recognize the PDGF receptor alpha-subunit. Detects the PDGF receptor beta-subunit of human and primate species (monkey and baboon) but not the rat or mouse receptors. Its ability to bind to receptors from other species has not been tested. Buffer Supplied in a saline solution containing BSA and Sodium Azide. Stockage commentaire Protect from light. Do not freeze. 12 months from date of receipt,2°C to 8°C as supplied. 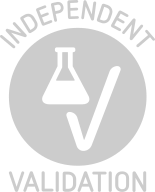 Produit citée dans: Huang, Couto, Pinto, Alexandrescu, Madsen, Greene, Sahin, Bischoff: "Somatic GNAQ Mutation is Enriched in Brain Endothelial Cells in Sturge-Weber Syndrome." dans: Pediatric neurology, Vol. 67, pp. 59-63, 2017 (PubMed). Méthode utilisée: Flow Cytometry (FACS) (Échantillon (espèces): Human). Huang, Nakayama, Klagsbrun, Mulliken, Bischoff: "Glucose transporter 1-positive endothelial cells in infantile hemangioma exhibit features of facultative stem cells." dans: Stem cells (Dayton, Ohio), Vol. 33, Issue 1, pp. 133-45, 2014 (PubMed). Méthode utilisée: Flow Cytometry (FACS), Flow Cytometry (FACS), Flow Cytometry (FACS) (Échantillon (espèces): Human). Guijarro-Muñoz, Cuesta, Alvarez-Cienfuegos, Geng, Alvarez-Vallina, Sanz: "The axonal repellent Slit2 inhibits pericyte migration: potential implications in angiogenesis." dans: Experimental cell research, Vol. 318, Issue 4, pp. 371-8, 2012 (PubMed). Méthode utilisée: Flow Cytometry (FACS), Flow Cytometry (FACS), Flow Cytometry (FACS) (Échantillon (espèces): Human).